How many dogs and cats am I allowed to have in the City of Burbank? 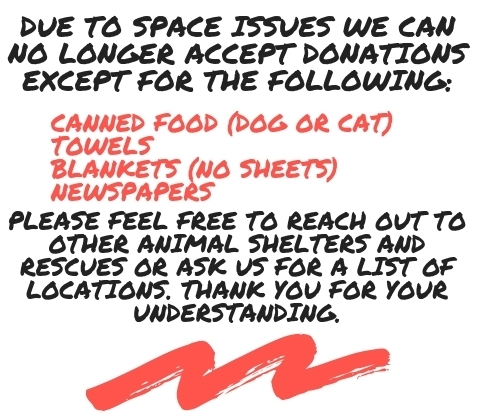 What if the shelter is closed and I need assistance? Can I turn my animal in to the shelter? How long are animals kept at the Burbank Animal Shelter? Are you a “no kill” shelter? When will you get kittens and puppies? How often do you get new animals? Your tax-deductible donation will be carefully used to enhance the quality of life of shelter animals by providing needed medications, veterinary care, surgical equipment, and facility enhancements to improve operations. The Burbank Animal Shelter strives to be a leader in providing the highest quality care for our animals and your generous donation will enable us to continue our noble work. You can use your credit or debit card to make a gift using our Donation Form online. A receipt for donations over $50 will be mailed to the address listed on the check. If you would like the receipt to be mailed to a different address, please include the information in the envelope. Now you can donate directly to the Burbank Animal Shelter through the Petfinder Foundation’s Sponsor a Pet Program. The Sponsor A Pet program encourages the community to help homeless pets by sponsoring their shelter. When someone has found a homeless pet that has touched their heart but they are unable to provide that pet their forever home this program gives them the avenue to help. It costs an average of $150 a day to provide care for a homeless pet while they await their forever home. Even a small contribution can give a homeless pet the chance that they deserve. Visit the Burbank Animal Shelter’s Petfinder Sponsor a Pet page to make a donation on behalf of any adoptable pet. Your donation will be a one-time donation to help homeless pets at the Burbank Animal Shelter. Much of what the Burbank Animal Shelter does to save animal lives depends on the help of volunteers. Volunteering is fun and rewarding, and it is also a great way to help homeless animals. There are many opportunities for you to help the animals either at the shelter, at an off-site event or even from home! Currently, the Burbank Animal Shelter is accepting applications through the assistance of two organizations: the VBAS, and City of Burbank Volunteer Program. The VBAS is an independent non-profit organization, operated almost exclusively by volunteers. They are devoted to providing medical, social, behavioral and financial care for animals at risk and determined to eliminate animal homelessness in the Burbank community. To view more information visit http://thevbas.org. Must commit to volunteer 8 hours per month. Must commit to volunteering for a minimum of one year. You must sign up for an orientation to apply to become a VBAS volunteer. BVP was originally started to help partner non-profits, local schools, and local public agencies with senior volunteers. BVP now has over 600 active volunteers, serving in Burbank and its surrounding communities. All other ages over 18 are accepted. Commitment hours vary by position. Front Desk Assistant – greet customers, answer phones, and provide walk-in customers with information regarding Shelter programs and adoptions. Kennel Worker - cleaning kennels, feeding and watering the animals, and providing basic care for sick and injured animals. All Burbank Animal Shelter volunteer applicants are required to go through LiveScan and a minimal background check. Through the Career Technical Occupation Program, students receive training at the Burbank Animal Shelter that helps prepare them for entry-level employment in facilities such as kennels, pet shops, zoos, and veterinary hospitals. The Career Technical Occupation Animal Care classes focus on training in animal-handling, animal identification, animal disease, basic animal first aid, euthanasia, animal housing and animal nutrition. In addition, students will understand the rules, regulations and agencies governing animal care, as well as the history of animal care and control, responsibilities of government animal welfare agencies, laws relating to wildlife conservation and control, principles of euthanasia, animal care center operations, animal housing and hygiene. Students must be 16 years or older, and a junior or senior in high school. To enroll, visit your high school Career Center. With dogs staying in shelters for longer periods of time it is increasingly more important to provide them with a better quality of life. Kuranda beds provide a shelter dog with a soft, dry, off the floor place to relax. The calming effect reduces stress levels promoting adoption. Your gift will provide a shelter dog a comfortable bed for many years to come. Give the Gift of Comfort to a shelter dog or cat. Your kindness will make a world of difference to them! Prices are specially discounted when donating. Items ship directly to the shelter in your name.